I took a liking to the stylized Latin font in FFXIV's realm of Eorzea, as can be seen on in-game maps and sign posts, &c. So much so that I created my own versions with a twist which I have made available here, as well as fonts made by others as I discover/like them. Eorzean writing is just as versatile as normal Latin letters when it comes to font variations! To save bandwidth, your browser should load the fonts locally if you have them installed, with the caveat that you may not have the latest versions. I've included sample text of each font with a few choice words in addition to the alphabet to showcase various special characters. These words are: façade, Ætheryte (the crystals in the game, using historical spelling), Rœgadyn (one of FFXIV's races, using a ligature based on the rough etymological source their names are based on*), Tromsø (a city in Norway known for auroræ), and Gildengeheiß (the German version of the game term Guildhest). Ligatures in the font are purely for fun: in game they are all separated into digraphs for ease of the game's programming and are not valid characters for player names. *It was revealed in an interview with English localization lead Fernehalwes that the Roegadyn language is derived from Old High Germanic, so oe digraphs may be more properly represented by ö (umlauts) than by œ (ligatures), or perhaps even left as digraphs when applied to words of Roegadyn origin. This page will be updated if and when this possibility is confirmed. Of course, it's also been said that Eorzeans are mostly illiterate, so any 'standards' or lack thereof of the written word are made up by upper class individuals, leaving us free to write however we damn well please. If there are any glyphs you'd like to see in the fonts that I haven't included please let me know and I'll consider adding them in, though I can't guarantee that I will. By all means, if you want to share my fonts with others, go for it. I welcome and encourage you to do so, that's why I made them! I only ask that you cite credit, as it's just proper courtesy. I've released my fonts free of charge and they will always be that way, but—if you're so inclined—donations via the PayPal button below are of course welcomed and appreciated if you really enjoy the fonts and have found them useful. If you know of any other Eorzean styled fonts or examples of Eorzean text in images that aren't posted here, please let me know by tweet @dachoutom, or email fonts -at- dachoutom -dot- org. If at any time the download links are broken, please let me know ASAP, but in the meantime they should always be available by hand-typing in dachoutom.org/fonts/filename.ext for the font/format combination you desire (the filenames you can get from hovering over the normal links, they're named the same way). The reason I don't link them this way by default is to offload bandwidth to cloud storage, so please only use it as a last resort. They are hosted on the same server as the website itself, so if you can reach this page, then they will work. While I know many out there use and appreciate my fonts, there's only so far I can go without injecting my own style into them. Maybe you'd be interested in creating a version of the Eorzea font in your own style, but don't know how to go about turning your ink scrawls into a TrueType file that computers can actually understand as a font. I would welcome this sort of collaboration and if you would like to join forces with me in such an endeavor feel free to message me using one of the afore-mentioned methods! Some extra details are below in the collaborations section at the bottom. Eorzea is the most basic of the fonts and wasn't made by me. It is an unofficial tracing of the actual font used by Square Enix to create the game's content (best I can find is claims it was done by a pair going by the names of Tristis and AaronDMorgan, but haven't verified that so I don't know 100% for sure who made it). Unforunately, they didn't include the Eorzean version of numerals or punctuation—somewhat understandable given how obscure they were to find and recognize in the v1.0 market wards and other Lodestone materials—and I don't personally like their choice of font for missing characters as I don't think they match stylistically. Bizarrely, they also screwed up at least one of the characters: lowercase L doesn't extend to the cap-height as it should, which makes it harder than it should be to distinguish i and l. I haven't done a thorough check over every single character for any other errors. While I do provide the original file as a mirror download, I have made edits to address the above shortfalls and added the most basic accents and ligatures into an 'Extended' version, available as a completely separate download above. The Extended version is used to display the sample below. 0123456789$ ! @ # % & ? Obviously several characters are missing or use Latin glyphs because they aren't included. Notable exclusions are the gil symbol, œ, þ, and ß because these would require contruction from scratch and not simple tracing (Æ is also messy for the same reason: I took a shortcut in simply mashing the existing A and E together instead of creating a truly unique glyph for it). However, because this font has the most basic forms of all the fonts it is the most utile with high legibility at all sizes. Sort of like what Eorzeans might use for print in their newspapers, which is why I sometimes jokingly refer to it as Times New Sil'dihn (Sil'dih being a dead Eorzean civilization, just as the Roman Republic/Empire is no longer around). @Bwin4L (Twitter)/bulletbill4l (Reddit) has taken my Extended version and added Hingan characters (as seen around Kugane, etc.) and properly mapped them to their corresponding hiragana/katakana code points. Note that there is only one actual set in Hingan: it's just mapped to both syllabaries. In addition, Hingan also has some combined vowel characters that Japanese does not have, and those were added to the Private Use Area. Supposedly, these extra glyphs are even coded as ligatures so that if you input e.g. ああ you'll get the relevant character instead, though I've not gotten it to work properly in any program. Even if you don't care about the Hingan this can be an alternate way to download Extended for regular Eorzean letters since the main link seems to frequently get taken down by Dropbox. Eorzean Script is my first ever attempt at making any kind of font, let alone one for FFXIV. My main purpose was to acheive an informal 'handwritten' style to Eorzean text compared to the rigid, blocky original. 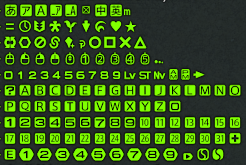 I also wanted a font that included the numerals that Eorzea was missing. Going further, I wanted to extend the glyph set to incorporate international support not seen in the regular font, including not only accented characters like ö but also ones not often encountered in English such as ç, Ø, ß (German double-s, a ligature of long-s and either short-s or z depending on the typeface), the ligatures æ and œ, and international punctuation glyphs such as the inverted question mark (¿) and French and German style quotation marks. Even obscure crap like thorn (Þþ) and eth (Ðð) are in there! These extensions are my own unique interpretations of how Eorzeans would implement them and should be viewed as unofficial. Many words used in the game would properly use these ligatures but—as confirmed by the developers—for ease of programming have been separated into digraphs (compare Ætheryte vs. Aetheryte). The dollar symbol was changed to be the symbol for the Gil in FFXIV as well. I've also made some of these additions to the 'Extended' basic version above. Overall, I'm not terribly keen about the font even though I created it as I can see/feel its amateur-ness, and my insistence on using a calligraphic nib for lore reasons put the result somewhere between casual and formal with such bad penmanship that it just ends up ugly. But hey: it was my first font ever so I guess it deserves a little leeway and to stay around. The Script style maintains a fairly high legibility, though it is less than the plain Eorzea font. Because the script style is less blocky than the original, kerning between some characters can be an issue. I've included embedded kerning for the most common pairs but some may need individual adjustment. Many programs (including Microsoft Word) do not enable kerning by default so you may have to search the web on how to enable it for your specific program. Eorzean Cursive is my second font and this time I went for sweeping, elegant style. After some discussion on the FFXIV Lodestone forums about whether it was possible to make a decent looking joined-up style of Eorzean writing, I took it upon myself to meet the challenge with this font as the end result. Obviously to make it work as a font I had to force all letters to link at a single unified height; it would probably come out slightly different if one were to actually write Eorzean Cursive by hand, with dependencies on adjacent characters. There's probably a way to do that in a font too, but it would be far above my skill level. I incorporated the same level of international glyph support that I provided in Eorzean Script, but for Eorzean Cursive I've omitted quite a few of the special characters that I didn't see as being of any practical use in a more formal style. Someday I might consider adding these in. The high degree of stylization comes at a tradeoff of terrible legibility at smaller sizes. Because the glyphs are joined up, kerning should be less of an issue for this font, though you may still occasionally need it where some upper-case characters are involved. For some reason it renders worse in Microsoft Word than any other program I've used the font in but it should still print out onto paper just fine (or saved to an image format), despite the on-screen appearance. The perfect choice for invitations to your Ceremony of Eternal Bonding! Okay, so I lied above: Eorzean Elegant was actually my initial attempt at a fancy font, not Cursive. It was quickly superceded by Cursive because I thought Elegant ended up looking more curly-cutesy than actually elegant and refined. A lot of the upper-case characters were retained in the switch to Cursive (aside from slightly italicizing them in Cursive), so the two fonts are very similar at first glance. This font has pretty much the same pros and cons of Eorzean Cursive, since it was basically the prototype version. Because Cursive replaced it I no longer actively maintain this one and it is missing some of the characters like Œ and probably a lot of the accented characters, however I provide it here as a legacy option. The two fonts have different names and identifiers, so they should be able to coexist peacefully on a single computer. Because of the graininess in the font each letter contains a LOT more shape data than my other fonts, so the file size of this one is a bit higher than the others. You may actually notice some delay before it renders when using it, depending on how pimped out your PC is. Enjoy! Eorzean Fraktur is a second move towards the "fancier" side of styling. It is heavily based on the typeface seen in the Good King Moggle Mog and world map images in the section below, i.e. I more or less traced what letters were available and then improvised those that were missing. As such, much of the credit for this font deserves to go to the creative staff at Square Enix, and for the most part I only wrapped it up in a nice package for people to use. In contrast to some of my other original fonts, the clean lines of Fraktur help to make it quite legible even at small sizes. The only major caveat with Fraktur is that the capital O glyph is highly embellished with a long tail, so it can mess with line spacing a bit, but that shouldn't be too hard to adjust for either by simply moving the next line down, offsetting the O if possible, or just breaking the words around the tail as I've done in the sample above. Inspired by the way I occasionally write our weekly dinner menu and shopping list for my wife's amusement, I decided to take that same tall, compact style with crisp neat lines and adapt it to Eorzean. It is in some ways similar to the common font Impact. A bit more of a modern flair to this one compared to the other fonts I've released, bringing Eorzea into the current age. With its simple form, there should be no major issues when using Compact. While watching The Lord of the Rings, I was inspired to make a very rustic font for Eorzean. Uncial is a type of insular script that was often used in old religious manuscripts and other scribework in the 4th–8th centuries, i.e. it's the perfect fit for your Fifth Astral Era copy of the Enchiridion. I've tried to reflect its real world roots with attempts at such things as a more insular-style G glyph. It can also evoke a somewhat Celtic feel. Of immediate note is that—unique among my fonts—Uncial is a majuscule script, meaning it has no such thing as upper- or lowercase letters. If you absolutely wish to have something resembling lowercase or smallcaps, you will have to adjust the font size manually. Otherwise, this font should provide few other issues to work around.To be as historically accurate as possible, words should have minimal to no separation between them, though this obviously impacts legibility. Although they are not fonts, those with an interest in Eorzean typography might like the following writing samples that can be seen in various FFXIV media SE have released, usually as promotional images for seasonal in-game events or supplemental lore articles on the Lodestone (i.e. The Mythril Eye, The Harbor Herald, or The Raven). Besides the actual Eorzean Font, many people wonder about what normal fonts are used in the game such as the chat log and parts of the UI so they can be used in fan-created artworks/projects. Unsurprisingly, they're pretty much all professional/premium fonts (i.e. not free). I'll try my best to also give out a close approximate from those commonly preinstalled with most operating systems that would be hard to tell the different at a glance but also won't break your wallet. Huge shoutout to roxahris here, who positively ID'd these in the credits and data files and emailed me about it. I really only figured out the first one by myself. Chat log, nameplates, etc. — Most of the UI, including but not limited to the listed items, is in a font called AXIS. You can read all about it in an interview with Naoki Yoshida about choosing the game's font. If you don't want to pony up the cash for the real deal (and for a cool $2,599, I don't blame you), Myriad or Meiryo should serve you well. In general you're looking for sans-serif with double-story lowercase a, and single-story lowercase g. Bear in mind some symbols in the game make use of the Unicode Private Use Area, so they won't exist or will look totally different in other fonts and maybe not even within the stock version of AXIS either. These are things like the gil or HQ item symbols that carry no meaning outside of the game (see this Reddit post and image). Limit Break bar, HP/MP/TP, most other text written in caps — This one is called Miedinger ($69.95), but Eurostile/Eurostar Extended are close substitutes, or a modified Copperplate Gothic Light can work in a pinch as I've done on my commissions page progress bars. Player names in some windows, "A Realm Reborn" and patch/zone title cards — Here we have a Roman Empire inspired font named Jupiter ($69.95). The player names appear to use a condensed variant of this one. Often a small diamond is used in place of the crossbar for capital A, which might be another variant of the font but is not visible in Canada Type's sample image: it may be an edit made by Square Enix themselves. Any Romanesque font with serifs that you happen to have preloaded on your computer should do fine here, perhaps with tweaking and set to small-caps. The best matches will have capital J's that only bend slightly at the bottom with a short descender rather than turning fully upright above the baseline, such as Trajan or Cambria but not Times New Roman. Window titles, subtitles/captions, etc. — Trump Gothic Pro ($99.95) is the font used in these locations. Slightly condensed, sans-serif goodness! Free alternatives could include a condensed Calibri or Franklin Gothic, or even the font used on this very page: Droid Sans. A key feature to note is the uncommon combination of a double-story/looptail g variant while also being sans serif (usually you'll find them in serifed fonts). The fonts are provided in the OpenType format, and you can install them the same as you would any other font you can download off the internet. Once installed to your OS any program should have access to it, for example Microsoft Word or Photoshop. Easy. All my fonts so far have been designed using vector methods in Illustrator, so they should scale up nicely to large sizes on screen or in print without losing any fidelity. Kerning can be important on these fonts, and for some of them I've included it embedded in the font file itself. If you're unfamiliar with what kerning is, you can read about it on Wikipedia, but the gist of it is that it allows letter blocks to "overlap" slightly when the letters themselves have slants or overhangs. A strong example of this in my fonts involves upper-case F followed by lower-case letters (e.g. Fa, Fo, Fe, etc.). Without kerning there's a huge white-space that ends up between the letters, but with kerning they tuck in nicely close to the vertical stroke of the F, with the horizontal stroke acting like a little roof over their heads. Makes the font look a lot more natural and readable. For other programs you'll have to look up how to do it yourself, but it should be a fairly similar process to these two. The embedded kerning may not always be perfect, so there will be cases where manual kerning might be preferred, which those links should also explain. You can use the fonts on your own website, just like I have on this page, and it should be fairly straightforward if you're familiar with HTML/CSS. Browsers should also automatically use the embedded kerning as well to make it look nice and clean. With my latest revisions, I've also provided the alternate .woff format of my fonts which compresses the files for better bandwidth management. Those versions can be downloaded above in their respective sections by choosing "Web Format (*.woff)". Chrome in particular seems to handle the .otf files poorly and sometimes it either won't render or won't apply kerning or other undesired behavior, so I highly recommend using the .woff versions. Where fontname is obviously the name of the font you want to use (with spaces, e.g. 'Eorzean Script' or 'Eorzean Cursive') and linktofont is the URL of the location you saved the font file to. What this does is tell the browser to first load the font locally on the user's computer if they have it installed already, which will save you bandwidth. If they don't have it installed, then it will fall back on the link location so that the user still sees the custom font. You can also add more url() arguments at the end for additional fallbacks. This isn't meant to be an exhaustive tutorial on HTML/CSS however, so if you're still confused about the above you really ought to go learn more HTML/CSS on your own before trying to implement this again. If you have administrative level controls to a forum, it should also be possible to create a custom BBcode tag that enables Eorzean text using the above HTML/CSS code, but that's beyond the scope of what I'm trying to do here and hopefully if you have that level of access you should already know what you're doing anyways. As mentioned above at the top of the page, I would be happy to team up with others in creating even more font styles for Eorzean where you write/draw out the letters and I turn them into a usable font for you. At the most basic level, you'd need to fill out a template for a custom font such as this one. A Google Image Search for "font template" will also pull up many other similar examples. Cap height/ascender: This is where the top edge of your capital letters should be, as well as things like the taller parts (the ascenders) in lowercase b and d. Strictly speaking these are two different things and they could be different, but in most cases they line up or very close to it. x-height/median: This is where the tops of your lowercase letters should be (i.e. the height from the baseline of a lowercase x, hence the name). Baseline: The bottoms of all your letters, both uppercase and lowercase. Descender: For letters like lowercase p and q that extend below the baseline, the part that pokes out is called the descender. Feel free to omit some of the more esoteric characters like thorn (Þþ) and eth (Ðð), or even add characters, but most importantly do as many diacritical/accent marks as possible (acute, grave, tilde, breve, caron, umlaut/diaresis, cedilla, ogonek, etc.) and do them seperately from any letters. I do encourage including as many of the strange letters as possible though, to expand Eorzean for use into as many international languages as possible. The letter ß for example is important in German, which has a fairly sizable FFXIV playerbase (I use a mix of capital S and lowercase z to form it, but since it's an unofficial addition, you could come up with your own way of making it as well). Remember the font won't just be for you after all! I'm happy to answer questions about any symbols you're unfamiliar with, since we can certainly continue exchanging messages through the whole font-making process. You can fill out the template however you're able, by either printing it out and using a pen/pencil then scanning it back into the computer or by doing it completely digitally, for example in Photoshop. For the absolute best results and if you have the know-how to, you'd want to do it digitally using a program that allows you to make the letters as vector objects (e.g. Illustrator or the pen tool in Photoshop) so that the font can scale up to large sizes with no loss of quality. Scanned or raster images will start getting blurry the larger the font size. Digital methods also afford the luxury of the undo button if you mess up a letter. Once you've filled in the template just send the file to me and I'll take it from there! Unless you say otherwise I'll assume you want normal spacing between the letters, but if you'd rather have the letters squished together (condensed) or spread out (expanded), let me know and I can make that happen. FINAL FANTASY XIV © Square Enix Co., Ltd. FINAL FANTASY is a registered trademark of Square Enix Holdings Co., Ltd. All material used under license.